Tomorrow is National Root Beer Float Day! I wanted to make something to celebrate the day besides root beer float which don’t require a recipe. 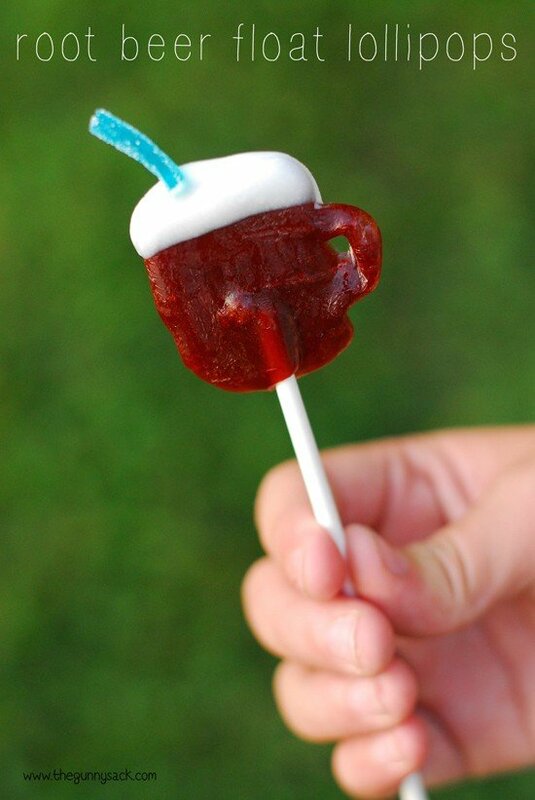 Vanessa made Jolly Rancher lollipops this summer and that gave me the great idea of making root beer float lollipops! Except it wasn’t so great after all. I did my first test run and they looked like blobs. So, I made another batch and this time I tried making a handle. Then, I sent a picture of the lollipop to a couple of my friends. The first one said she really had no idea what it was. The second friend said “Santa?” Ahhh…back to the drawing board. So, I tried again and this time I used a thin knife to help shape the candy while it was still soft…and it worked! 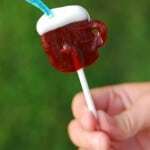 To make the root beer float lollipops, start by placing about 5 unwrapped root beer barrels on a baking sheet lined with a silicone mat or parchment paper. Leave lots of space between the root beer barrels so that there is space to spread and so that you can add a lollipop stick. Speaking of root beer barrels, they used to be sold everywhere and when I wanted to find them, suddenly they were scarce. I eventually found them at Mills Fleet Farm. If you can’t find them in a store near you, they are available on Amazon. Bake the root beer barrels for about 12 minutes at 300 degrees. 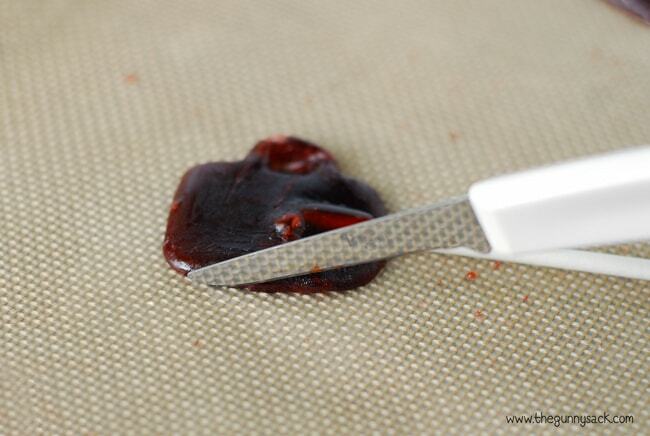 Remove from the oven and quickly put a lollipop stick into each melted candy. Give the lollipop stick a gentle twist to wrap the melted candy around it, ensuring it really stays in place. Working quickly shape the hot candy using a thin knife. You want the sides and top of the mug to be somewhat flat. Quickly pull some of the hot root beer barrel to one side, forming a handle. Press the candy above and below the handle back towards the center to make the side of the mug. This really helps to make it look like a root beer mug. If the candy hardens before you can do the all of the shaping, simply return it to the oven to soften again. Next, melt the white chocolate chips or candy coating (I used CandiQuik) according to the directions on the package. 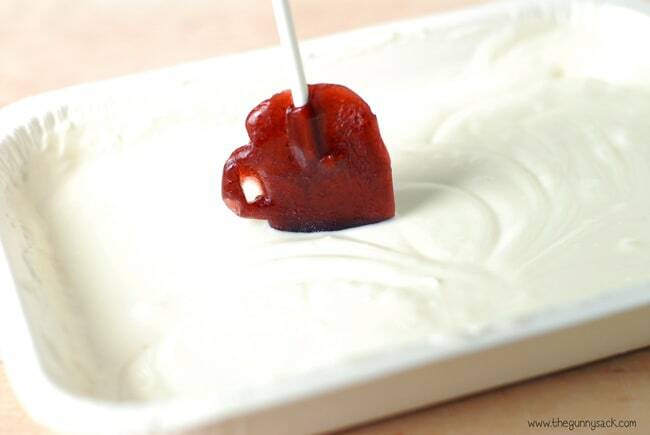 Dip the tops of the lollipops in the melted white chocolate or candy coating. Place them back on the silicone mat to harden. Cut small segments of brightly colored, gummy candy strings for straws. Attach with a little of the melted white chocolate or candy coating. 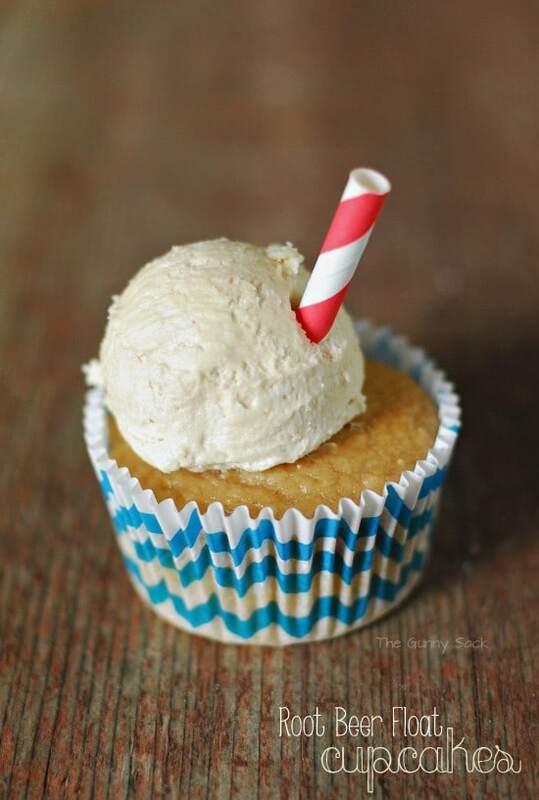 Give them to your kids for National Root Beer Float Day! 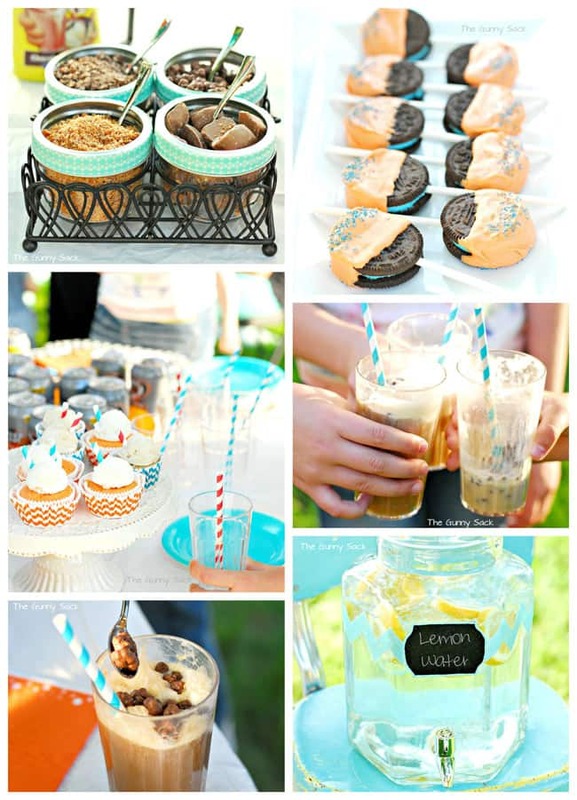 These would also be a lot of fun to give out at ice cream themed parties. 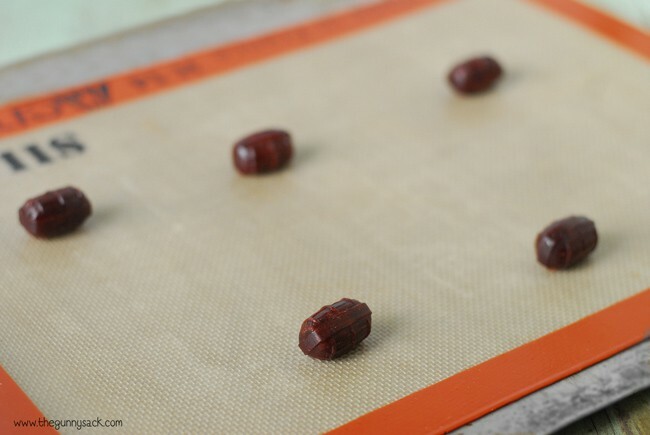 Place 5 unwrapped root beer barrels on a baking sheet lined with a silicone mat or parchment paper. Leave lots of space between the root beer barrels, so that there is space to spread and so that you can add a lollipop stick. Bake the root beer barrels for about 12 minutes at 300 degrees. 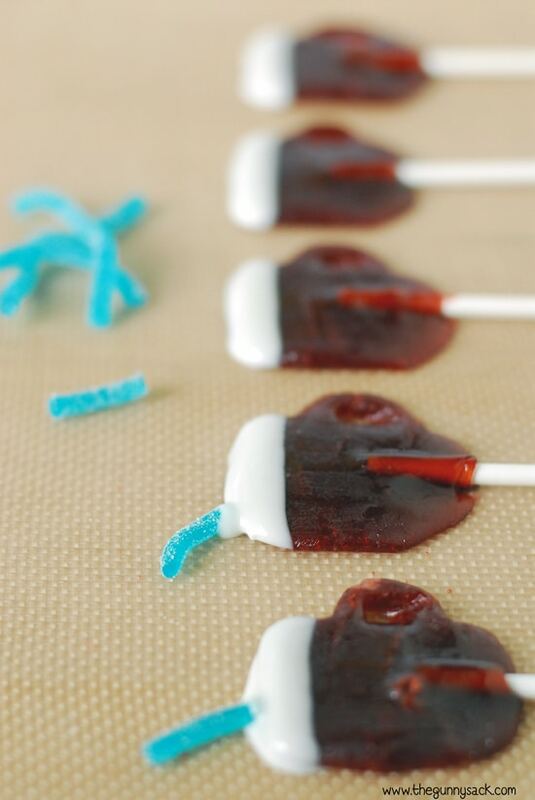 Remove from the oven and quickly put a lollipop stick into each melted candy. 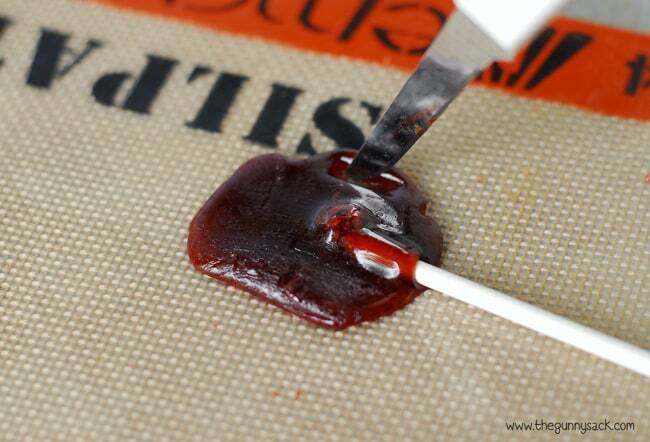 Give the lollipop stick a gentle twist to wrap the melted candy around it, ensuring it really stays in place. Working quickly, shape the hot candy into a mug shape using a thin knife. You want the sides and top of the mug to be somewhat flat. Quickly pull some of the hot root beer barrel to one side, forming a handle. Press the candy above and below the handle back towards the center to make the side of the mug. This really helps to make it look like a root beer mug. If the candy hardens before you can do the all of the shaping, simply return it to the oven to soften again. Melt the white chocolate chips or candy coating in the microwave. 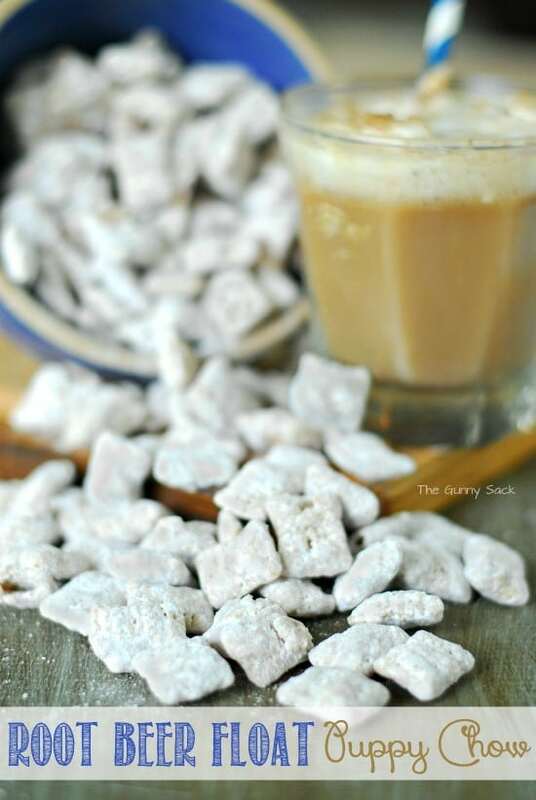 Dip the tops of the root beer float mugs in the melted white chocolate or candy coating. Place them back on the silicone mat to harden. Cut small segments of brightly colored, gummy candy strings for straws. Attach with a little of the melted white chocolate or candy coating. These lollipops look amazing, Tonia! I can’t tell if it’s Bloglovin’ or me today, but I just left a comment and it seems to have disappeared. Whomp! Anyway, I love these 🙂 And I’m a huge fan of root beer anything, so will totally have to make this. Thanks for the recipe! Oh my goodness…. how cute are these little pops? I love root beer anything, so really appreciate this post 🙂 Adorable!